As last activity for the portfolio, I really wanted to find some kind of theatrical representation. In my opinion, theatre is the best way to remain in contact at least for an hour with a foreign language and culture. At first, I was not very pleased with the idea of driving to Brussels and watch the play on my own... Yes, because unfortunately everybody had already done all their activities or had planned something else! Too bad for them! But then I just thought that if it was a nice play, there was no point in having a classmate or a friend sitting next to me. Finally, I was delighted by the performance and I hope to find some more plays like this one. So this is how I went to watch Dancing at Lunghnasa by Brian Friel. The performance was played by the Irish theatre group in the Warehouse studio theatre in Schaerbeek. There, I was really surprised to find myself in a very small, intimate place, which I must admit was much in tune with the theme of the play. The small room was filled with English-speaking people (English, Irish) and it is far more than possible that I was the only French-speaking person watching the play. All of this (the small place, the English people) created a kind of friendly Irish atmosphere. Dancing at Lughnasa is set in Ireland, and more precisely in the Mundy spinster's house. The sisters share this place with their auntie, who is a schoolteacher and with Maggie, the housekeeper. Those two characters are quite the opposite. On the one hand, we have Kate, the auntie who is worried about their future because she realized that the situation of the family is very fragile; and on the other hand, there is Maggie, the housekeeper who is aware of the hard times but at the same time tries to relax everybody by telling jokes all the time. An other important characteristic of the play is that the story is told by the narrator, who is also the little boy of the house (Chris's son). The actors were all extraordinary in their role. Nevertheless, one of the actor was difficult fo me to understand because he played the role of the boy's father who is a man coming from Wales. So I don't know if this accent is very typical but it was extremely funny though. The scenario is constantly waving between moments of sadness, despair and moments of joy and love. 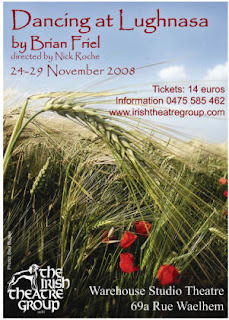 Finally, the play pictures in a very realistic manner what was life like in Ireland during the collapse of the Irish economy. heyy that was the topic of one of my essays here! Cool, I didn't know they were playing it in Belgium, that's nice... it's less nice that I missed it though, I wonder if they are going to play it again? Btw, if I may :), Kate the schoolteacher and Maggie the "housekeeper" are sisters, they all are... maybe they changed it in this particular performance though... And yes, Gerry's Welsh accent is pretty tough to understand! There's a good 1998 movie adaptation if ur interested, with Meryl Streep in the role of Kate, it's rather faithful to the play. Awesome TARTAN PLAID FABRIC Its material is so good. Keep continue such kind of efforts.